The Kraillinger Brauerei, also known as the “Kraillerei” amongst the locals, is a classic style Bavarian beer located along the small river Würm in Krailling, 18 kilometres south west of Munich city. 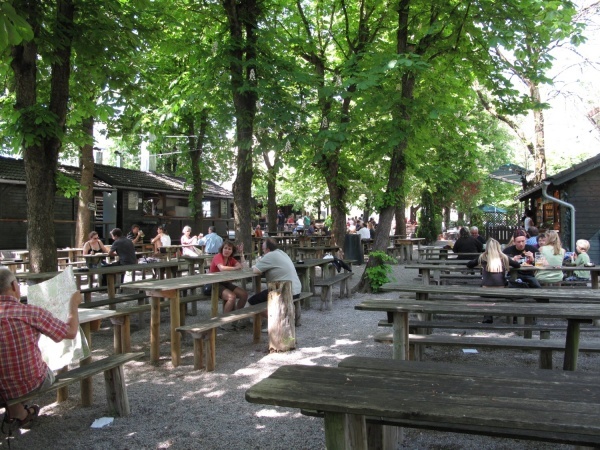 With about 2,500 seats the Kraillinger Brauerei is the largest of four beer gardens situated within an approximate 1½ km² radius. The beer garden is connected with a restaurant including a small serviced terrace, a bar and a ballroom which is a popular venue for weddings and other special occasions. There is a mix of old-style wooden tables that are fixed to the ground and more typical wooden benches in the self-service area, all of which are mostly shaded by large chestnut trees. Kraillinger Brauerei was a brewery at this location up until maybe 30 years ago. While the beer garden has retained its traditional atmosphere the beer is now supplied by the Bavarian brewery Herrnbräu. The light and dark lagers are tapped from wooden barrels and sold at €6.90 p/Maß (May 2015). The beer garden opens between 10am and 11am and closes about 11pm.